When you sit down for a nice gaming session, you have some choices for your audio. Specifically, do you want to have it coming out a set of speakers, or running through a headset? If you’re worried about bothering other people with the sound of gunfire and agonizing death, then a headset is an obvious choice. It also gives you the ability to talk with the other people in your party. We try and test out a variety of hardware, catering to both the budget-conscious and those that want quality at all cost. 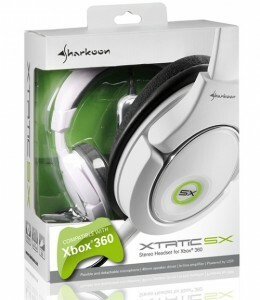 Today we’ll be taking a look at the Sharkoon X-tatic SX, which falls into the former category. It’s not the first Sharkoon X-tatic that we’ve seen. The last one was an excellent piece of hardware, with a $160 price tag. The SX will set you back less than half of that, but does it deliver less than half of the quality? 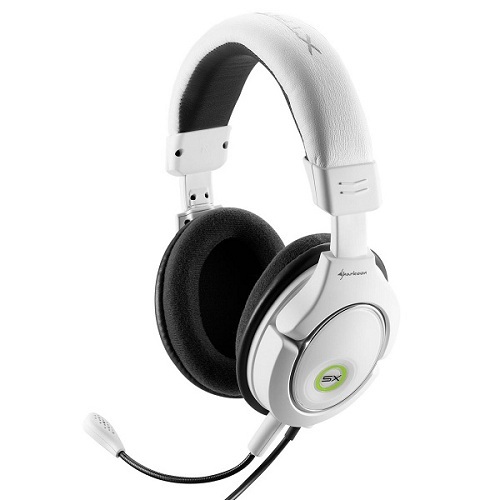 The X-tatic SX is a somewhat smaller headset than its predecessor, though not terribly so. A nice white finish, with gray cloth and silver/green accents give it a rather sleek look. Ear cups have a nice, soft padding, and rotate up to 90-degrees, likely to make storage all the easier. You’ll find in-line volume controls for both the headphones and mic, along with a master mute switch. Speaking of the mic, there is a detachable microphone included. The mic is flexible, which always gets points in my book. For the connections you’ll find a standard headphone and microphone jack. An attached USB cable provides power to the headset. 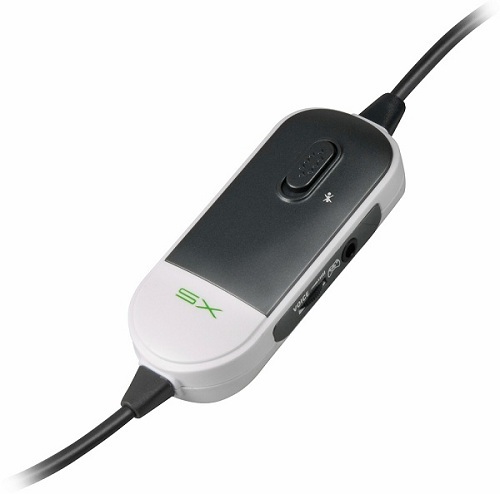 For the Xbox 360 gamers, there is a 3.5mm to RCA adapter, which can be used to jack into the analog audio cables. Another adapter cable provides a connection to your 360 controller for the mic. There’s not a lot of setup required for these headphones. If you’re on a PC, just simply plug in the two audio jacks and the USB cable for power. The 360 setup is only slightly more complicated. You’ll need to connect the two adapters mentioned above, and plug them into their respective ports. Once you’ve taken care of that, just plug in the red and white cables. You should then hear audio from both your TV and the headset. Turn down the volume on your TV, and you’re ready to roll. The SX gets its audio from a pair of 40mm speakers and an in-line amp. This provides surprisingly good sound, better than I expected from the price. The bass was strong, with and the amount of volume that these pump out is enough to block out any other noise in the room if you choose to crank it up. You’ll also catch even the smallest of sounds that would go otherwise unnoticed with lesser headphones or regular TV speakers. There’s not a lot to be said about the microphone. It works well, with no reported issues from other people I was talking to. As I said before, the mic is fully adjustable, which meant I could position it exactly where it should be for optimal use. Comfort isn’t the strongest point on these, but they are by no means terrible. As I stated before, it’s not the largest headset I’ve used. The earpieces do adjust up and down, but what I found to be the worst was that the space between the two ear cups wasn’t enough. After a good bit of stretching them apart, they stopped pressing so tightly against my head. Also, the padding around the ears wasn’t as soft as I’d care for, but this is a minor complaint. I was surprised at the overall quality of this headset, considering the price point. Not only are you getting something that can work with both your PC and 360, but you’re getting good sound and not paying a fortune. The Sharkoon X-tatic SX retails for around $60, which I would be happy to pay for it.